This tournament was held on the weekend of 20/21st September up at Bridlington in Yorkshire. Our much travelled Darter Scott Mitchell was playing again in this event hoping to go better than his semi-final defeat in 2013 against the eventual Champion Garry Thompson. This event was covered live on Eurosport 2 from the quarter-finals. It proved to be perfect viewing for all in Dorset, as Scott had again got himself through to the televised stages. He had a tough quarter-final match against the two time world champion Ted Hankey, who is just coming back into his power scoring best. Scott edged out Ted winning the match 4-3 with his two magnificent final legs. His semi-final was a repeat of the England Matchplay against Gary Robson, a fantastic even match with a plethora of 14 dart legs that went down to the wire. The final leg won after very tense double shooting from both players, showed they were human, after robotic scoring and checkouts. A relieved Scott winning 5-4. This set up the chance for Scott to claim another title. 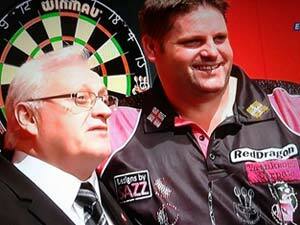 Billed as "the Landscape Gardener vs the Dustman", typifying what the BDO is all about. His opponent was Wales Captain Martin Phillips, with unblinking concentration, the Bransgore Landscaper only losing one leg, won the match 6-1 and the title of British Open Champion 2014. No time to rest for Scott, he will be leaving Bridlington to fly out to Romania for the Europe Cup. Best of luck to him and his fellow England players.